Fractale premiered in January of 2011 as part of the noitaminA animation block on FujiTV. The series’ inclusion in noitaminA led to high expectations. The block, putting aside its lame name (animation spelled backwards), has a reputation for interesting and innovative shows, including Honey and Clover, Eden of the East, and House of Five Leaves. Fractale looked like it would fit that mold, as an original fantasy story with beautiful visuals. Unfortunately, while Fractale is set in an interesting world that is well animated, it doesn’t successfully address the interesting and timely problems posed by a world reliant on technology. My favorite aspect of Fractale is the world in which it’s set. It includes an augmented reality system and neural network that allows people to communicate with each other through 3D avatars called droppels. The droppels let people avoid unpleasantries like leaving the house. This fosters a sense of isolation in the main character, Clain, who lives alone in a small cottage in what looks like the Irish countryside. Clain rejects the pervasive technology of his world in favor of technology from the past. His isolation is interrupted by a visit from a mysterious girl who involves him in his world’s larger struggle of pro-technology religious fundamentalists versus anti-technology rebels. Clain’s parents’ avatars. Proving once again that parents just don’t understand. This background is explained in the first episode and provides a good foundation for the series, one that ultimately the writers didn’t build on successfully. Clain’s unhappiness with the virtual world is one shared by many people today. His struggle provided an opportunity for the show to comment on the negative impact of people’s obsession with technology, including its tendency to lead people to withdraw from the physical world. For example, the show could have explored the proper balance between maintaining physical interactions and at the same time not turning into a Luddite. This isn’t a brand new subject by any means. Even Dentyne Gum saw fit to make a commercial about how people should reject digital interactions and “Make Face Time”. Still, even if this issue doesn’t break completely new ground, having some meaningful ideological struggle to relate to would have been welcome. Instead of providing some commentary on the struggle, the show focuses on the physical battle between the factions, playing it out in gunfights between the rebels and the religious fundamentalists. When the characters do talk to each other about whether the world’s system should be abandoned or embraced, they do so in general terms and incomplete terms. Even after the fighting ends, and some final decision seems imminent the ideological dilemma is left unresolved. The show’s lack of a meaningful social commentary left its unoriginal story exposed. One of the reasons that people eagerly anticipated Fractale was that it wasn’t adapted from an existing manga, giving the creators a great deal of flexibility of where they wanted to take the story. It appears they opted to follow the path of Last Exile. The story and characters bears remarkable similarities to the characters and story in Last Exile. Both shows have 1) a teenage male hero (Clain and Claus respectively) who joins the crew of 2) an older male (Sunda and Alex Row) that leads his comrades in a fight against 3) an evil female tyrant (Moeran and Delphine). In Last Exile this plot worked because Alex Row and the crew of the Sylvanna were interesting characters in their own right and carried the show forward. Here, Clain and his friends’ don’t have as well-developed personalities, perhaps because the show only ran for 11 episodes. This made it difficult for the show to remain interesting given that the plot followed a well-traveled path. Luckily, the show learned one positive lesson from Last Exile, that a beautifully animated show makes for happier viewers. Say what you will about the characters or the plot, the animation looks great. The beginning of the show takes place in an idyllic Celtic landscape of quaint cottages and fields of grass. 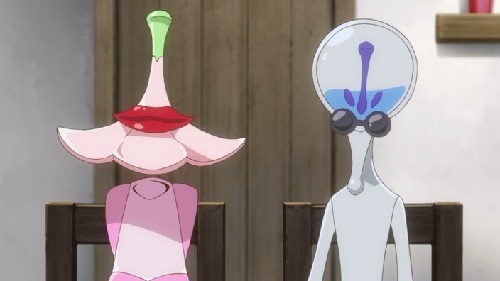 The character’s visual designs, particularly the designs of the droppels, are whimsical and cartoon-like. The battle scenes, though short, don’t drop in quality even when things speed up. The animation quality can’t rescue the show on its own, but it surely makes the show easier to watch. Fractale never fulfilled initial expectations and I’d have a hard time recommending it to anyone. Maybe if you haven’t seen Last Exile the plot will seem fresh and interesting. And if you like beautiful animation Fractale won’t be a disappointment. 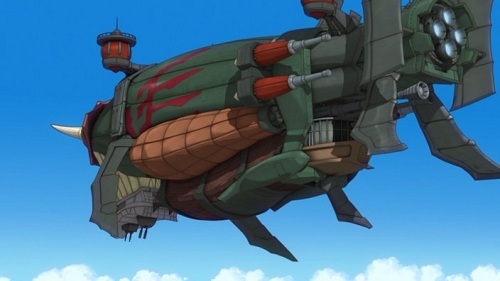 Still, if you haven’t seen Last Exile, you’d be better just seeing that rather than seeing Fractale. That’s a shame, I really like Fractale – but this is a fair review!